The Portugal talisman will have to serve a mandatory one-game ban when Juve face Young Boys on October 2. Ronaldo, 33, appeared to pull Valencia defender Jeison Murillo’s hair on his European debut for the Serie A champions. But UEFA sources have suggested that the suspension is unlikely to be extended to a two or three matches which would have ruled him out of an emotional return to Old Trafford on October 23 and Juve’s home game against Jose Mourinho’s team on November 7. Ronaldo left the pitch in tears following his red card upon his return to Spain. The case will be dealt with by UEFA’s control, ethics and disciplinary panel next Thursday. The panel are now waiting for the referee Felix Brych’s official report before making a final decision on Ronaldo’s ban. 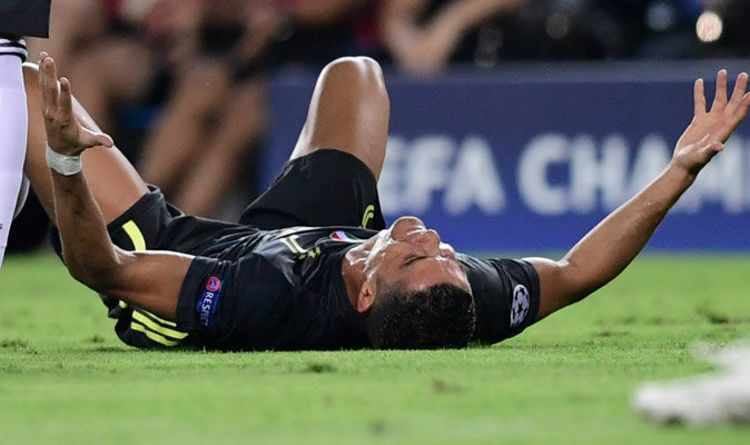 Should UEFA decide to punish the Portugal star, Juve chiefs are expected to lodge an immediate appeal in hope of having Ronaldo available to face United. However, Express Sport understands Juve are confident it won’t get to that stage. Extended bans are usually handed out for more serious offences. Article 15 of UEFA’s regulations states that bans of more than one game are for offences such as abusive language towards a match official, serious assault or for receiving a caution or red card on purpose. Many felt the decision to send Ronaldo off was harsh, and former Premier League referee Mark Clattenburg says Brych’s assistant let him down. “Cristiano Ronaldo was very unfortunate to be sent off on his Champions League debut for Juventus,” he said. “With the ball on the left wing, the forward tried to make a run into the penalty area and was blocked off by Jeison Murillo. “There was a small push from Ronaldo which resulted in the Valencia defender falling to the floor but that was not violent conduct. “Referee Felix Brych had his back to the incident. “It was spotted by the additional assistant, standing behind the goal, who may have thought Ronaldo threw an elbow but that was not the case. “Ronaldo was then clearly annoyed by Murillo’s play-acting and placed a hand on the defender’s head. “The contact looked very slight and I cannot see how the additional assistant, standing some 20 yards away, could deem it violent conduct. “If I had been officiating this game, I would have given Valencia a free-kick and shown a yellow card to each player.